The time and place is early 16th century Europe. Imagine Ireland, Germany, and Poland without potatos. That's right, no Irishman has yet seen a potato. Imagine Italian cuisine without tomatos. Pasta is common throughout Europe, brought from the Middle East by Marco Polo, but there's no tomato sauce. Imagine France, Germany, and Switzerland without chocolate. Imagine cakes and desserts without vanilla—without sugar. Sugar is known in Europe but is rare and expensive. The primary sweetener is honey. Imagine a diet without corn, or beans, or sweet potatos, yams, strawberries, or pineapples. There are no peanuts or peanut butter to go with the chocolate you don't have. There's no zucchini, no squash or pumpkins, no avocados, or cashew nuts, or tapioca, and no chili peppers. Black and white pepper is the spiciest flavoring around. There are no common beans, just fava beans—no white beans, red beans, black beans, kidney beans, or lima beans—no string beans or green beans. And there's no tobacco—nobody smoking a pipe, no cigars, no snuff. Sound boring? It was. The European diet was pretty bland. Nourishment mostly came from breads, pasta, grain and meat porridges, apples, pears, berries, beer, eggs, fish, and except for the very poor, quite a lot of meat. There was no citrus fruit to speak of and no rice, both of which came from Asia, and no coffee, which came from Arabia. Several foods that originated in the Americas have become critical to the diet and the survival of people around the world today so it's impossible to say which is most important. So, the following sections are not in any particular order. When Columbus arrived, American Indians were cultivating over 3,000 varieties of potatoes and had been doing so for 10,000 years. Wild species occur from the United States in North America to Uruguay in South America, although Peru is considered the birthplace of the domesticated potato. Thousands of those species still exist today. There are places in the Andes where a hundred varieties can be found in a single valley. However, 99% of the potatos cultivated in the world today are descendants of a variety indigenous to south-central Chile. Today, the potato is the world's fourth largest food crop. The potato was brought to Europe in 1536 and was spread by seafarers to the rest of the world. It quickly became a staple food crop in Europe. It was so successful at feeding the people of Ireland that it touched off a population explosion, resulting in hordes of Irish immigrants to the United States. By 1800 it was not unusual for an Irishman to eat ten pounds of potatos a day. But the lack of genetic diversity in Europe left the potato vulnerable to various diseases. One potato disease known as late blight, caused by a fungus-like oomycete called Phytophthora infestans, was responsible for the Great Irish Potato Famine of 1845. It spread rapidly in western Ireland and resulted in widespread crop failures. More than a million Irish died of hunger and 1.5 million more emigrated to the United States, resulting in a huge increase in demand for the potato in the USA. Averaged over the world's population, we each consume about 75 pounds of potatoes a year. The highest per-capita production has traditionally occurred in eastern Europe and Russia, with Russia producing the most of any country. But this has changed in recent years as the potato's popularity has spread to Asia. China is now produces more potatoes than any other country. Together, China and India harvest about a third of the world's potatos. Tomatoes are native to South America but the date and exact history of the tomato is not known. Evidence indicates that the tomato probably originated in Peru as a small round green fruit, the ancestor of today's cherry tomato. This species diversified and was transported in prehistoric times to Mexico where it was cultivated by the Aztecs and their forebears. The Aztecs called it xitomatl (shee-toe-mahtl), which means "plump thing with a navel." Later it was just called tomatl, the Nahuatl word for the tomato, by the peoples of Central America. Aztec writings describe a dish prepared with tomatos, corn, chile peppers, and salt—probably the original salsa recipe. The sketchy history of the tomato continued. It's not clear which European explorer brought the tomato to Europe. Some historians believe it was Columbus in 1493, others believe it was Cortez around 1521. However, most historians believe the tomato made its way to Europe by way of Asia after it was brought there on Magellan's voyage around the world. The first European writings about the tomato come from 1544, by the Italian botanist Pietro Andrea Mattioli, who named it pomme d'oro or golden apple. Perhaps the most beloved foodstuff in the world came from the New World: chocolate. Chocolate is made from the toasted and fermented seeds of the cacao plant. The scientific name for the plant is Theobroma cacao which means "food of the gods" and it's been cultivated in Central America for over 3,000 years. The word chocolate derives from the Nahuatl word xocolatl (sho-ko-lahtl). Cortez learned of chocolate from the Aztec king, Moctezuma, who consumed cup after cup of hot chocolate throughout the day. In Aztec and Mayan society, cacao seeds were valuable so they were used as currency. Only the king or the most wealthy consumed chocolate. Moctezuma believed that chocolate increased virility. The Aztec drink was prepared by mixing cacao and ground hot chile peppers in boiling water, then whipping it. Moctezuma had a staff person whose only job was preparing one cup after another for him. Modern research indicates that theobromine, the principal chemical in cacao, has various beneficial effects including lowering of blood pressure by relaxing the walls of blood vessels and improving mood. The relaxation of blood vessel walls means that Moctezuma's belief that chocolate improved his virility was on the mark after all. Theobromine's effect on blood vessels is similar to that of modern drugs used to treat ED. Today, most cacao is produced in Africa and the cacao is processed with milk to make the various forms of sweet and bitter milk chocolate with which most of us are familiar. But straight cacao, not processed with milk, and mixed only with sugar, is still commonly available in Guatemala. The product is made by small local factories and comes in the form of large round cookies. One breaks the cookies into four pieces and each quarter makes a cup of hot chocolate. The drink is excellent or the cookies can be broken up and eaten as a delicious bittersweet chocolate candy. Many, even most of the cakes and other sweets that we consume would taste entirely wrong without vanilla. Vanilla is a key ingredient in cakes, confections, drinks, and candies. Vanilla is produced by about 90 species of orchid. Vanilla planifolia orchids are still cultivated by the Totonac Indians in Central America, who were probably the first to domesticate it, but only two varieties are used to produce commercial quantities of vanilla. Today, almost all of the world's vanilla cultivation takes place in Madagascar and the Comoros. But cultivation amounts to only a tiny fraction of the vanilla produced in the world. The chemical that is extracted from the orchid is called vanillin and today there are various processes for producing vanillin in large quantities. "Natural" vanillin is produced by a bacterial process. "Artificial" vanillin is produced by a chemical process. But vanillin is a chemical and nowadays there's absolutely no difference between vanilla extract, natural vanilla, and artificial vanilla, except price. The strawberry is a flowering plant in the rose family, Rosaceae. It was found growing wild in the eastern United States and in South America. Fragaria (pronounced fruh-jerry-uh) virginiana is a variety found in the United States and Fragaria chiloensis was found in South America. The first attempt at cultivation took place in the 1600s with the woodland strawberry, Fragaria vesca, . Then in the 1700s, a hybrid between the South American F. chiloensis and the North American F. virginiana was developed which resulted in the modern cultivated strawberry. Today there are about 20 varieties with flavors ranging from sweet to tart. The most common cultivated variety is the garden strawberry, Fragaria xananassa. Today, strawberries are grown in temperate regions around the world. Corn was domesticated from a wild plant called teosinte more than 7,000 years ago in Central America. Corn is central to the Mayan creation myth and is considered a sacred plant. For detailed information on the mythology and methods for preparing corn to eat, see the Maya Paradise article Tortillas. The ears of the wild teosinte plant were small but years of domestication resulted in larger plants and larger ears of corn. Corn was brought to Europe as a curiosity by the first explorers and Europeans were not much interested in it. However in Africa it spread quickly and together with the peanut and cassava from the Americas, completely transformed the diet of much of Africa. The productivity and nutritional value of these foods resulted in a rapid rise in population in Africa, similar to the effect of the potato on Ireland. The Moors reintroduced corn to Europe via Turkey and North Africa but it still didn't catch on with the people of Europe. Corn was viewed by most Europeans as animal feed and not appropriate for humans. This attitude prevailed, at least in Germany, into the 20th century. Corn is adaptable to a wide variety of climates. Some varieties grow as tall as 7 meters (23 feet) but most corn grown in the world is hybrid corn growing to a standardized height of 2.5 meters (8 feet). Corn is the most efficient of all cereals at converting sunlight into sugars and other carbohydrates and it's become a vital component in the diet of hundreds of millions of people. More than 330 million metric tons of corn are produced by the United States alone. Corn is the main staple food in much of Africa. In recent years, corn is being diverted from the food supply to the manufacture of ethanol for use as a motor fuel. This diversion is creating food supply problems that aggravate world hunger. As of 2010, 817 million metric tons (MMT) of corn are produced annually worldwide. The biggest producers are the USA, 332 MMT, and China, 162 MMT. Chili peppers, the fruit of the genus Capsicum, have been cultivated in Central and South America for at least 9,500 years and were widely used as foods, spices, and medicines. The fruit is technically a berry and there are hundreds of varieties, ranging from grapefruit-sized bell peppers to tiny peppers a few millimeters in size. Some are round, some are long and fat, some are long and thin. Depending on the flavor, peppers are used as a vegetable and/or a spice. Peppers that have no "heat" are sometimes called sweet peppers. Christopher Columbus first encountered chili peppers in the Caribbean. Because their spicy heat reminded him of European black pepper (piper) he called them peppers. However there is no botanical relationship or physical resemblance between the two. The first chili peppers were brought to Spain on Columbus's second voyage by the physician Diego Alvarez Chanca in 1493. He wrote about their medicinal effects in 1494. Chili peppers were not very popular in Europe initially. But explorers also spread them to the Philippines and then into Asia where they were quickly adopted into the local cuisine. The spicy heat of Chinese Szechuan and Thai dishes comes from peppers that originated in the Americas. The hot curries of India derive their heat from ground dried chili peppers. The pepper plays a big part in the cuisine of the Goan region of India where Vindaloo originated. From here, two things happened. First, the popularity of chili peppers spread through Asia, to Turkey, and to Hungary, where paprika became the national spice. Second, hot curry became popular with English colonists living in India and when they returned to England they brought their cuisine with them to England. There is also speculation that some form of chili pepper made its way to Europe before Columbus. Archaeologists discovered remains of Capsicum frutescens in St. Botulf in Lund dated to the 13th century CE. The Greek Theophrastus (370-286 BC) describes the chili pepper. And around 100 CE the Roman poet Martialis described a hot pepper that was long and contained seeds so it could not have been black pepper. There are many indications that there was commerce between South America and Africa long before Columbus so perhaps this explains the findings. The sweet potato, Ipomoea batatas, originated in southern Mexico or Central America, where it is called the camote (kah-moh-tay). The sweet potato is a tuber but has no botanical relationship to the true potato, which originated in the Andes. Europeans first encountered the sweet potato in the Caribbean. The Spanish brought the sweet potato across the Pacific to the Philippines and the Portuguese spread them to the rest of Asia. The sweet potato was quickly adopted in Asia as it is both tasty and an excellent foodstuff, loaded with nutrients. In Japan it became popular partly because it resists insects and typhoons that can destroy rice crops. During the Japanese famine of 1730s, the sweet potato saved many from death by starvation. Today, China grows 80 percent of the sweet potatos harvested in the world. The common bean, Phaseolus vulgaris, was first domesticated in the Andes. It is now grown worldwide and eaten as dried beans and green beans. The leaves are also eaten as a vegetable. The bean plant is a legume and a nitrogen fixer beneficial to the soil. There is a wide variety of beans including black beans, pinto beans, red beans, white beans, navy beans, kidney beans, pea beans, pink beans, flageolet beans, cranberry beans, borlotti beans, roman beans, cannellini, yellow beans, and many others. 18.3 million metric tons of dry beans are grown each year worldwide. Green beans are of the same genus, just eaten with the pod while still green. Green beans have been bred to have a fleshier and sweeter pod. They are known in England as French beans and in the United States as string beans. They are sometimes called snap beans or squeaky beans. The first stringless green bean was bred inn New York by Calvin Keeney in 1894. Green beans are an important part of Chinese cuisine. Anout 6.6 million metric tons of green beans are grown worldwide each year. The top dry bean producers of the world are India 4.87 million metric tons (MMT), Brazil 3.2 MMT, Myanmar 3.03 MMT, China 1.53 MMT, USA 1.4 MMT. The top green bean producers are China 13.03 MMT, Indonesia 0.88 MMT, Turkey 0.59 MMT, India 0.58 MMT, Thailand 0.3 MMT. The lima bean, Phaseolus lunatus, originated in Peru and was first domesticated there around 2000 BCE (4,000 years ago), producing the large seed variety. P. lunatus was domesticated again in Central America around 800 CE (1,200 years ago), producing a small-seeded variety. Within a few hundred years, cultivation of the lima bean had spread north of the Rio Grande. The lima bean was introduced into Europe in the 1500s. The Spanish colonists of Peru exported bean production to Europe and the containers of dried beans were labeled Lima – Peru, and the name stuck. The term butter bean is applied to the the large flat yellow-white lima bean, macrocarpus or P. limensis, but the term means different things to different people. In the southern US, butter beans and lima beans are viewed as separate types of beans. In that region, butter bean refers to the Sieva variety, also called Dixie or Henderson beans. In the UK, butter beans refers to dried beans or canned beans. From a culinary standpoint, lima and butter beans are viewed as different things. Butter beans are large and yellow. Smaller or greenish beans are called lima beans or baby limas. Cassava, yuca, or manioc, Manihot esculenta, is a woody shrub native to South America. It was probably first domesticated in west-central Brazil about 10,000 years ago. Pollen remains indicate that manioc reached the area around the Gulf of Mexico around 8,500 years ago. Cassava was cultivated by the Mayans at least 1,400 years ago. Cassava has high food potential and was a staple in South and Central America, and the Caribbean when the Spanish arrived. Today, manioc is cultivated in tropical and subtropical regions around the world. Cassava, together with yams and sweet potatoes are important sources of food in the tropics. The cassava plant gives the highest yield of food energy per cultivated area per day among crop plants, except possibly for sugarcane. Cassava accounts for 30% of the daily calorie intake in Ghana. In the subtropical region of southern China, cassava is the fifth largest crop in term of production, after rice, sweet potato, sugar cane, and maize. Cassava is harvested for its starchy edible root. Four made from the roots is called tapioca. It's the third largest source of carbohydrates for human consumption in the world. World production of cassava root is estimated to be around 184 million metric tons (MMT). The majority of production occurs in Africa where 99.1 MMT were grown. 51.5 MMT were grown in Asia and 33.2 MMT in Latin America. Nigeria is the world's largest producer. Cassava is classified as sweet or bitter depending on the level of toxic cyanogenic glucosides contained. Improper preparation of bitter cassava leads to cases of a disease called konzo. Nevertheless, farmers often prefer the bitter varieties because they deter pests, animals, and thieves. The name "cassava" is sometimes spelled cassaba or cassada. The plant may be occasionally called by local names, such as yuca (most of Spanish-speaking Americas), mandioca, aipim, or macaxera (Brazil), kassav (Haiti), mandi'o (Paraguay), akpu or ugburu (Nigeria), bankye (Ghana), mogo or mihogo (Swahili), kappa (India), maniok (Sri Lanka), singkong (Indonesia), ubi kayu (Malaysia), kamoteng kahoy or balanghoy (Philippines), mushu (China), manioke or manioca (Polynesia). Cassava can be cooked in various ways. The soft-boiled root has a delicate flavor and can replace boiled potatoes in many uses: as an accompaniment for meat dishes, or made into purées, dumplings, soups, stews, gravies, etc.. Deep fried (after boiling or steaming), it can replace fried potatoes, with a distinctive flavor. Tapioca and foufou are made from the starchy cassava root flour. Tapioca can replace wheat flour, and is used by some people with wheat allergies or coeliac disease. The juice of the bitter cassava, boiled to the consistence of thick syrup and flavored with spices, is called cassareep. It's used in various sauces and as a flavoring. It is exported chiefly from Guyana. Cassava is used in drinks in East Asia. The peanut, Arachis hypogaea, is a legume native to South America, Mexico and Central America. After pollination, the fruit develops into a legume 3 to 7 cm (1 to 2 in) long, containing 1 to 4 seeds, which forces its way underground to mature. The domesticated peanut has two sets of chromosomes from two different species. Direct examination of the chromosomes shows the wild ancestors to be A. duranensis and A. ipaensis. This cross-breeding domestication occurred 7,600 years ago, probably in Peru, where the wild strains still grow today. Peanuts are variously called earthnuts, ground nuts, goobers, goober peas, pindas, jack nuts, pinders, manila nuts, g-nuts, and monkey nuts. In Central America the peanut is called cacahuate which derives from the Nahuatl tlalcacahuatl. The Spanish first encountered peanuts in the market in the Aztec capital, Tenochtitlan. The peanut was spread around the world by the Europeans. Surprisingly, the peanut did not come to the United States directly from Central America. The Portuguese brought the peanut from Brazil to Africa in the 1600s. It then arrived in the U.S. around 1800 from Africa. The Portuguese also brought the peanut to China in the 1600s where it became a popular feature of many dishes, often boiled. Since 2006, China has been the worlds largest peanut producer, growing 37.5% of world production. The next largest producers are India at 19% and Nigeria at 11%. The avocado, Persea americana, is native to the Caribbean, Mexico, South and Central America. It's been cultivated for 7,000 years. The pear-shaped fruit is technically a large berry and is a valuable crop. The avocado tree is a member of the Lauraceae family along with cinnamon, camphor and bay laurel. The avocado is known in Spanish as aguacate, which derives from the Nahuatl word ahuacatl, which means testicle. In parts of South America it's known by the Quechua name palta. Other English words for the avocado are butter pear and alligator pear. The Nahuatl word ahuacatl is compounded to form ahuacamolli, meaning avocado soup or sauce. The word guacamole derives from ahuacamolli. The tree was introduced to Indonesia in 1750, Brazil in 1809, the Levant in 1908. Today, the avocado is grown in the tropics around the world and in California, a temperate area. Avocados have long had a reputation as a sexual stimulant. The Aztecs called it the fertility fruit. The Mayans believed it had magical powers and was an aphrodisiac. For a long time, avocados were not purchased by persons wishing to maintain a chaste image. The avocado's buttery texture results from its high fat content. Although the avocado contains over 20 percent fat, it is monounsaturated fat. The pineapple, Ananas comosus, is native to south central South America. Over thousands of years, the inhabitants spread it throughout South and Central America to the Caribbean. Columbus encountered it in the West Indies and brought it to Europe. The Spanish also brought it to the Philippines, Hawaii in 1813, Zimbabwe, and Guam. Europeans managed to cultivate it in hothouses around 1720. The word pineapple first occured in English around 1398 in reference to the cones of conifer trees. Since the late 1600s we've called them pine cones. When Europeans first saw the tropical fruit in the 1500s, they called them pineapples because of the resemblance to pine cones, which at the time were still called pineapples. The pineapple is a bromeliad. The plant grows about 3 to 5 feet tall and produces about 200 flowers. Flowers range from light purple to red. Certain bat-pollinated species only open their flowers at night. When pollinated, the berries coalesce together. The multiple fruit is arranged in two interlocking helices, eight in one direction, thirteen in the other, each being a Fibonacci number. The pineapple can be cultivated from a crown cutting which matures and flowers in about two years with fruiting about six months later. The pineapple does not ripen after harvesting. If stored at room temperature it should be eaten within two days. If refrigerated, it can last 5 to 7 days. The fruit can be eaten fresh, cooked, canned, or juiced. In the Philippines, the leaves are used to make textile fiber and furnishings. Export of canned pineapples from Hawaii began in 1892. John Kidwell is credited with founding the pineapple industry in Hawaii. Large scale cultivation by U.S. companies began in the early 1900s. Among the most famous pineapple industrialists was James Dole. Dole and Del Monte began growing pineapples on the island of Oahu in 1901 and 1917, respectively. Maui Pineapple Company began pineapple cultivation on the island of Maui in 1909. In 2006, Del Monte withdrew from pineapple production in Hawaii, leaving only Dole and Maui Pineapple Company. Raw pineapple is an great source of the mineral manganese. One cup contains 76% of daily requirement. One cup also contains 131% of daily requirement of vitamin C.
The stem or stalk of pineapple contains the proteolytic enzyme bromelain, which breaks down protein. Fresh juice of the pineapple stalk is a powerful meat tenderizer. Most of the world's pineapples are produced in Asia. Thailand produces the most at 1.98 million tons, followed by the Philippines and Brazil. World production in 2001 was 14.2 million tons. The leading exporter of pineapples is Costa Rica at 322,000 tons. Three-quarters of the pineapples sold in Europe come from Costa Rica. The most common fresh pineapple sold in the U.S. And Europe is a low-acid hybrid developed in Hawaii in the 1970s. Various types of squashes and pumpkins grow all over the Americas. The word squash comes from the Narragansett word askutasquash, which means "green thing eaten raw." Similar words exist in other languages of the Algonquian family. The word was first published in 1643 in a work written by the founder of Rhode Island. Squashes belong to four species of the genus Cucurbita. These species produce a wide variety of squashes such as buttercup squash, hubbard squash, pumpkins. giant pumpkins, butternut squash, acorn squash, summer squash, pattypan squash, yellow crookneck squash, spaghetti squash, and zucchini. Gourds come from the same family. In North America, squashes are referred to as summer squash, which is harvested immature fruit, and winter squash, mature fruit harvested in the fall or winter. Summer squash has soft skin and can be cooked easily or eaten raw. Winter squash develops a hard skin and requires longer cooking time. Evidence shows that squash was probably first cultivated in Central America 8,000 to 10,000 years ago. Squash is one of the three crops traditionally planted together by Native Americans: maize, beans, and squash. They are sometimes referred to as the "three sisters." Planted together, the cornstalk provides a support for the climbing beans and shade for the squash. The squash provides ground cover which inhibits weed growth. The beans are legumes and fix nitrogen needed by all three plants into the soil. Other parts of the squash plant can be eaten besides the fruit. The seeds can be eaten or ground into meal, flour, or paste, or pressed for oil. Leaves, shoots, and tendrils can be eaten as greens. The flowers are used in Native American cooking. The papaya, Carica papaya, is the fruit of a tree-like tropical plant. It is also called papaw or pawpaw. Note that the South American mountain papaya, Vasconcellea pubescens, is a different plant. The eastern North American tree called pawpaw, Asimina triloba, is also a different plant. The word papaya comes from the Carib language. Papaya was first cultivated in the regions of southern Mexico and northern Central America. It's a large plant with a single stem 5 to 10 meters tall. The leaves spiral around the top part of the trunk. The lower trunk exhibits scarring at the locations previously occupied by leaves and fruit. The leaves are large, 50 to 70 cm across, and have seven lobes. The fruit are large, 15 to 45 cm long and 10 to 30 cm in diameter. The skin is amber to orange when ripe. The papaya is now grown in most tropical regions around the world. It grows rapidly, usually fruiting within three years. The papaya cannot tolerate frost. There are two common types of papayas. One has sweet red or orange flesh. The other has yellow flesh and is less sweet. The papaya is a rich source of vitamin A, carotenoids, vitamin C, B vitamins, lycopene, and minerals. The ripe fruit can be eaten raw. Green fruit can be cooked in curries, salads, and stews. The national dish of Thailand, som tam, is made from unripe papaya. The leaves and flowers can be boiled and used in salads or eaten like spinach. The seeds are edible and have a sharp spicy taste. They can be ground and substituted for black pepper. There is evidence that papaya leaf tea works as an antiplasmodial against malaria but the mechanism is not understood. Green fruit and the papaya tree's latex are rich in papain, a protease used for tenderizing meats. It's been used by Native Americans for thousands of years to break down tough meat fibers. Today it's used in powdered meat tenderizers. The guava, Psidium guajava, is native to southern Mexico, Central America, and northern South America. Europeans spread the plant which is now cultivated in the tropics around the world. The word guava derives from the Arawak name for the tree: guayabo. There are several species of guava such as the Brazilian guava, guisaro, Psidium guinense, the Cattley guava / strawberry guava, P. cattleianum, the Costa Rican Guava, P. friedrichsthalianum, the para guava, P. acutangulum, the rumberry / guavaberry, Myrciaria floribunda. The guava grows best in warm tropical climates but has been grown in Southern California. It thrives in humid or dry conditions but cannot withstand much frost. A frost will cause the tree to drop its leaves and can kill it. If this happens, the remains will often send up new shoots. The quality of the fruit is better where there are seasonal temperature swings rather than constant high temperatures. The plant is very adaptable which causes it to be a pest in some areas. It can withstand, neglect, flooding, and extremely high temperatures. The plant ranges from a few feet tall to 30 feet, depending on ambient conditions. Guava leaves are opposite oblong elliptic with an irregular outline, 2 to 6 inches long and 1 to 2 inches wide. Crushed leaves are aromatic. The guava is self-pollinating although it sometimes produces better fruit with cross-pollination. The fruit can be round, oval, or pear-shaped, 2 to 4 inches long. Odor and flavor varies widely. The best fruit are soft when ripe with a creamy texture and a rind that softens and is edible. There are hundreds of seeds but they are edible. Guavas change color when they ripen. In warm climates, guavas will ripen all year. Best flavor occurs if the fruit is allowed to ripen on the tree but it can be picked green and ripened off the tree. Ripening is faster at room temperature and if the fruit is placed in a paper bag with an apple or banana. In recent decades, the guava has been the subject of much medical research. Extracts from the leaves and bark are may contain substances effective against bacterial infection, cancer, dysentery, and pain. Passion fruit / passion flower, Passiflora edulis, is native to Brazil, Paraguay, and northern Argentina. Passion fruit was spread throughout the world's tropics by the Europeans. The fruit is round or oval with a yellow or dark purple color when mature. The fruit can be eaten or juiced. The juice of passion fruit is often added to other fruit juices to enhance aroma. Passion fruit is high is beta carotene and potassium. Research shows it is beneficial in treating high blood pressure. Purple passion fruit peel may help to control asthma symptoms. Cranberries, Vaccinium oxycoccos, are native to North America. The cranberry is a low, creeping shrub or vine up to seven feet (two meters) long and two to eight inches (5 to 20 cm) high. It has slender, wiry stems and small evergreen leaves. The flowers are dark pink, with very distinctive petals, leaving the style and stamens fully exposed and pointing forward. The flowers are pollinated by bees. The fruit is a berry, larger than the leaves. It is initially white, but turns a deep red when fully ripe. The fruit has an acidic taste. Cranberries were used by North American Indians to make a food called pemmican. Carried as an energy food on hikes or long trips, pemmican is made from jerky, cranberries, and fat. Cranberries were also used in other foods, as medicine, and as a dye. The Indians introduced cranberries to the starving English settlers in Massachusetts who incorporated them into their diet and used the berries to dye textiles. Cranberries are a major commercial crop in certain American states and Canadian provinces. Most cranberries are processed into products such as juice, sauce, jam, and sweetened dried cranberries, with the remainder sold fresh to consumers. Cranberry sauce is regarded as a vital part of traditional American and Canadian Thanksgiving holiday menus and some European winter festivals. In recent years, raw cranberries have been marketed as a "superfruit" due to their nutrient content and antioxidant qualities. Henry Hall was the first to farm cranberries in 1816 on Cape Cod. Cranberries were first shipped to Europe in the 1820s where they became popular wild crops in Scandinavia, Russia, and Scotland. Efforts are underway to farm cranberries in Guatemala. The cashew, Anacardium occidentale, is a tree in the flowering plant family Anacardiaceae. The plant is native to northeastern Brazil. Its English name derives from the Portuguese name for the fruit of the cashew tree, caju, which in turn derives from the indigenous Tupi name, acajú. It is now widely grown in tropical climates. The cashew tree is a small evergreen growing up to 32 feet (10m) tall, with a short, irregularly shaped trunk. The leathery leaves are arranged in a spiral and have a smooth edge. The flowers are produced in a panicle up to 26 cm long. Each flower is small, pale green at first, then turning reddish. The fruit of the cashew tree is quite unusual and is shown in the photo below. Cashew apple with fruit. Larger photos. The fruit consists of an "apple" with a hard drupe at the end. The "apple" is a false fruit or accessory fruit that is sweet and juicy. The false fruit has a delicate skin and cannot be shipped without damage so it's used to make juice. The actual fruit is the kidney-shaped drupe at the end of the false fruit. Inside is a single seed which is called a cashew "nut", although it's not actually a nut. The seed is encased in a hard double shell containing anacardic acid, a potent skin irritant. Anacardic acid is chemically related to urushiol, the irritant found in poison ivy. The drupe containg the seed grows first, then the sweet fruit develops. 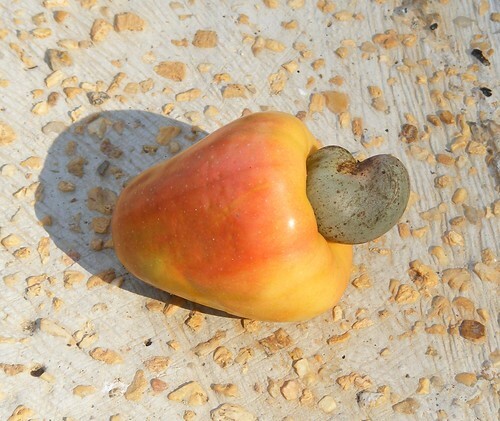 In Guatemala the cashew is called marañón. The false fruit is called "jocote de marañón". Cashews are delicious and tend to be expensive because of the complexity of harvesting and freeing the seeds from their shells. They are roasted and eaten or ground into a butter similar to peanut butter. Cashews were spread by the Europeans and now grow in most tropical areas of the world. They were readily incorporated into modern Asian cuisine but they originated in the Americas. For more information about this fruit, Rudy Girón has a good article here. The sunflower, Helianthus annuus, is an annual plant native to the Americas. The sunflower is named after its huge, fiery blooms, whose shape and image are often used to depict the sun. The plant has a rough, hairy stem, with broad, toothed, rough leaves. The flower heads consist of many individual flowers which mature into hundreds of seeds on a receptacle base. Sunflower seeds were brought to Europe in the 16th century, where they became a widespread cooking ingredient, especially the oil pressed from the seeds. Leaves of the sunflower can be used as cattle feed and the stems contain fiber that can be used to make paper. What we usually call the flower is actually a composite flower consisting of many small flowers (florets) packed together. The outermost florets are sterile and form the yellow, red or orange petals surrounding the flower head. The inner florets cluster in a fascinating interconnecting spiral pattern that results from each floret being oriented toward the next according to the golden angle of 137.5 degrees. The number of left and right spirals are Fibonacci numbers. Typically there are 34 spirals in one direction and 55 in the other. In really large flowers there can be 89 in one direction and 144 in the other. This pattern is the most efficient for packing the seeds in the flower head. Sunflowers typically grow 5 to 12 feet tall (1.5-3.5m). The world record is 8 meters or 25 feet. The sunflower was domesticated at least 5,000 years ago, probably in what is now the southeastern U.S. It was introduced to Mexico in prehistoric times. Remains of fully domesticated sunflowers have been dated to 2300 BCE in the area of Tennessee. Of the four plants known to have been domesticated in what is now the United States, sunflower is the most economically important. The pecan, Carya illinoinensis, is a species of hickory, native to south-central North America, in Mexico from Coahuila south to Jalisco and Veracruz, in the United States from southern Iowa, Illinois, Missouri, and Indiana to Virginia, southwestern Ohio, south through Georgia, Alabama, Tennessee, Kentucky, Mississippi, Louisiana, Texas, Oklahoma, Arkansas, and Florida, and west into New Mexico. The word pecan derives from an Algonquian word, meaning a nut requiring a stone to crack. Pecan trees can live and bear edible seeds for more than 300 years. They are mostly self-incompatible. Two or more trees of different cultivars must be present to pollinate each other. Pecans were widely consumed and traded by Native Americans. As a food source, pecans are a natural choice for preagricultural society. They can provide two to five times more calories by weight than wild game and require no preparation. As a wild forage, the fruit of the previous growing season is commonly still edible when found on the ground. Hollow tree trunks, found in abundance in pecan stands, offer ideal storage of nuts, both by humans and squirrels. The Spanish were the first Europeans to encounter pecans in what is now Mexico, Louisiana, and Texas. The genus Carya did not exist in the Old World but the Spanish were familiar with walnuts, genus Juglans, and they referred to pecans as "nogales" and "nueces", the Spanish words for walnuts. Thomas Jefferson wrote about the pecan trees he grew in his orchard at Monticello and referred to Carya illinoinensis as Illinois nuts. He gave some to George Washington, who planted them at Mt. Vernon. Manilkara chicle is a tropical evergreen tree native to Mexico and Central America. The tree ranges from Veracruz in Mexico south to Atlántico in Colombia. This tree yields a natural gum known as chicle, traditionally used in making chewing gum and other products. Chicle is a generic term that refers to the latex exuded by trees of the Manilkara genus. The most common source of chicle is Manilkara zapota. The word chicle comes from the Nahuatl word for the gum, tziktli (tseek-tlee), which means "sticky stuff". The Mayans have a similar word tsicte (tseek-tay). Chicle was well known to the Aztecs and the Maya. European settlers prized it for its subtle flavour and high sugar content. The ancient word is still used in the Americas. Chicle is the common term for chewing gum in Spanish. Chewing gum was not invented in the Americas. People in many parts of the world have been chewing mastic and tar-like substances for at least 5,000 years. But none of those substances have the quality of chicle. The first commercial chewing gum was developed from spruce sap in 1848 by John B. Curtis. It was called State of Maine Pure Spruce Gum. Around 1850 a paraffin wax based gum was developed that was much more popular. Modern chewing gum was first developed in the 1860s when chicle was exported from Mexico for use as a rubber substitute. Chicle did not succeed as a replacement for rubber, but as a gum it caught on quickly. Leading producers were Adams New York Chewing Gum (1871), Black Jack (1884) and “Chiclets” (1899). The Wrigley Company followed a few years later, making gum from Guatemalan chicle for the next 50 years. Wrigley sided with the United Fruit Company, opposing the 1952 land reform laws in Guatemala, and stopped purchasing Guatemalan chicle, causing great hardship to the peasants who harvested and processed chicle latex. Tapping chicle latex is similar to tapping the latex from a rubber tree. Zig-zag gashes are made in the tree trunk and the dripping gum is collected in small bags. It is then boiled until it reaches the correct thickness. Workers who collect chicle are called chicleros. Due to widespread tapping, the Manilkara chicle tree has become scarce. Partly because of Wrigley pulling out of Guatemala and losing this source of chicle and because of lower costs, since about 1960, chewing gum is no longer made with natural chicle. Today's chewing gums are made from hydrocarbon polymers including butadiene-based synthetic rubber, styrene-butadiene rubber, isobutylene, isoprene copolymer, paraffin wax, and petroleum wax. These are much cheaper and more readily available. Recently, concern has arisen about the carcinogenicity of vinyl acetate (acetic acid ethenyl ester) used by some manufacturers in their gum bases. The component is not mentioned but is hidden in the catch-all term "gum base". One of Columbus's goals was to find a western route to the Spice Islands, so it's ironic that the Americas only produced one important spice, allspice. Also called Jamaica pepper, pepper, myrtle pepper, and pimienta, allspice is the dried unripe fruit of Pimenta dioica, native to the Greater Antilles, southern Mexico, and Central America. It was spread by Europeans and is now cultivated around the world. It was named allspice by the English, who thought it had the flavor of cinnamon, nutmeg, and cloves. The allspice tree is an evergreen shrub, reaching heights of 32 to 60 feet (10-18m). Allspice can also be a small, scrubby tree, similar to the bay laurel, or it can also be a tall canopy tree grown to provide shade for coffee trees planted below. Allspice plants are dioecious so both male or female plants must be kept in proximity for fruit to develop. The fruit are picked when green and dried in the sun. When dry, the fruit are brown and resemble large brown peppercorns. The whole fruit has a longer shelf life so for maximum aroma, it should be ground just before use. The fresh leaves can be used like bay leaves but they cannot be stored and shipped because the dried leaves lose their flavor. Caribbean cuisine relies heavily on allspice. It is used to season jerk in Jamaica, in moles, sauces, pickling, and curries. Allspice has also become an important part of Middle Eastern cooking to flavor stews and meats. It is perhaps the most common spice in Palestinian cuisine. In Europe, allspice is part of many dishes, including cakes. In Germany it is used in large amounts to flavor sausages. In the United States, allspice is the main flavoring ingredient in barbecue sauces and gives the distinctive flavor to Cincinnati chili. An interesting fact about allspice is that it cannot be grown simply from seeds. Many attempts were made to grow allspice from seeds, but all failed. It was known that allspice is spread by birds. Experiments were performed using the constituents of bird droppings, however, these were also unsuccessful. Eventually it was found that passage through the avian gut was essential. Whether it's the acidity, temperature, or what, is still not known. Tobacco is not a food, per se, but is included in this list because it is ingested by more than 1.1 billion people and because of its economic impact. Low-income households around the world spend as much as 20 percent of disposable income on tobacco products. Tobacco is an agricultural product processed from the leaves of plants in the genus Nicotiana. It is consumed, used as a pesticide and as a medicine. It is most commonly used as a drug and is a valuable cash crop for countries such as Cuba, India, China, and the United States. Tobacco is a name for any plant of the genus Nicotiana of the Solanaceae (nightshade) family and for the products manufactured from the leaf and used in cigars, cigarettes, snuff, and pipe and chewing tobacco. The chief commercial species, Nicotiana tabacum, is native to tropical America, but has been cultivated for so long that it is no longer known in the wild. Nicotiana rustica, a mild-flavored, fast-burning species, was the tobacco originally raised in Virginia, but it is now grown in Turkey, India, and Russia. Tobacco had been in use for thousands of years as an entheogen in the Americas. After the arrival of Europeans in North America, it quickly became a trade item and widely-abused drug. This popularization led to the development of the southern economy of the United States until it was replaced by cotton. Following the American Civil War, a change in demand resulted in the development of the cigarette. This product quickly led to the growth of tobacco companies. Many Native American tribes grew and used tobacco. Some cultivation sites in Mexico date to 1400-1000 BCE. Eastern North American tribes carried large amounts of tobacco in pouches as a trade item. It was smoked in peace pipes, in sacred ceremonies, to seal bargains, and to celebrate the stages of life, including childhood. Tobacco was believed to be a gift from the Creator and that the exhaled smoke carried one's prayers to heaven. Before the development of lighter Virginia and white burley strains of tobacco, the smoke was too harsh to be inhaled. Inhaling "rough" tobacco without seriously damaging the lungs in the short term required smoking only small quantities at a time using a pipe. The origin of the word tobacco is not clear. The Spanish word tabaco is believed to be based on a word from Taino, the language of the Arawak peoples of the Caribbean. However, Fray Bartolomé de las Casas wrote in 1552 that "tabago" referred to a kind of pipe used to smoke tobacco and that the leaves were called cohiba. It is also known that in 1410, before Europeans ever encountered tobacco, the Spanish were using a 9th century Arabic word, tabbaq, to refer to medicinal herbs. The word nicotiana and nicotine is in honor of Jean Nicot, French ambassador to Portugal, who in 1559 sent it as a medicine to the court of Catherine de Medici. Numerous other foods and materials came from the Americas including turkeys, rubber, brazil nuts, mahogany (caoba), hickory, prickly pear, huckleberries, annatto (achiote), cochineal dye, poinsettias, maple syrup, and logwood.